During the week of January 13-18, Campbell’s School of Osteopathic Medicine invited Dr. Nevin Katz to address its students — as well as medical students and residents at Harnett Health in Dunn and Cape Fear Valley Health in Fayetteville — as a part of the Woodrow Wilson Lecture Series. Katz is an adjunct associate professor of surgery in the Division of Cardiac Surgery at John Hopkins University and is the founder and president of the Foundation for the Advancement of Cardiothoracic Surgical Care. The Woodrow Wilson Lecture Series is a resource offered through Campbell’s membership in the Council for Independent Colleges. 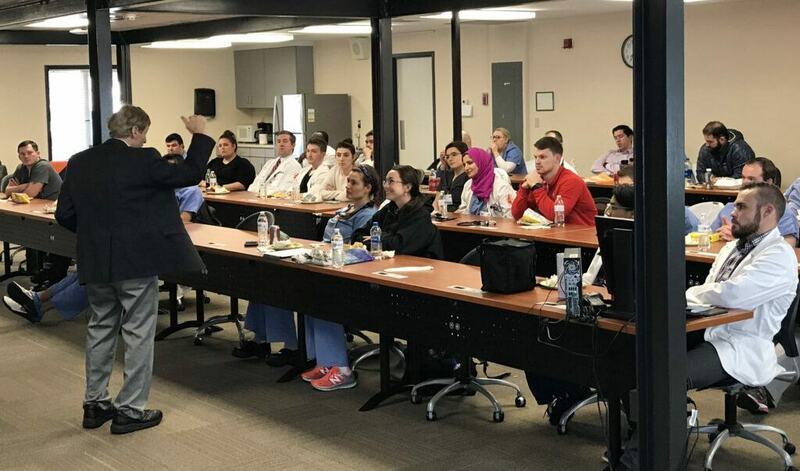 First- and second-year medical students enjoyed Katz’s lecture, “The Team of Medical Professionals Providing Patient Care; Specialties, Communication and Checklists” in Leon Levine Hall of Medical Sciences. Third- and fourth-year medical students as well as resident physicians at Campbell University affiliate hospital Cape Fear Valley Health heard from Katz regarding “Acute Kidney Stress – Complication to Concept to the Development of Innovative Technology“, “Goal Directed Hemodynamic Management – Key for Optimal Critical Care” and “System-structured Management of Acute Patient – An Alternative to the Problem Oriented Method From Medical School to ICU” throughout the week of his visit. 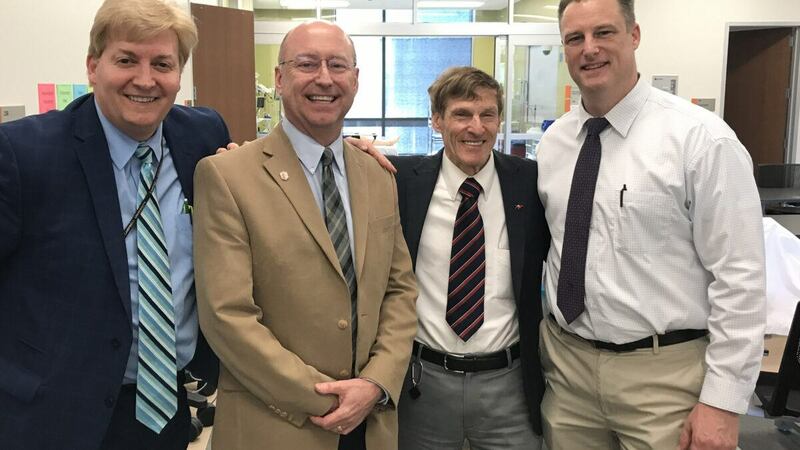 Dr. Katz also visited Campbell University affiliate hospital Harnett Health where he presented “Goal Directed Hemodynamic Management – Key for Optimal Critical Care” for Grand Rounds. Katz’ final lecture at Campbell, “Artificial Intelligence and Challenge of Acute Kidney Injury” presented to the School of Engineering, was informed by his experience working with graduate students in biomedical engineering at Johns Hopkins to develop a new device for measuring creatinine levels in patients who suffer from acute kidney injury — a device that was simpler, more effective, and less prone to cause infection.